Dance 411: Bikini Body 8-Week Fitness Challenge! 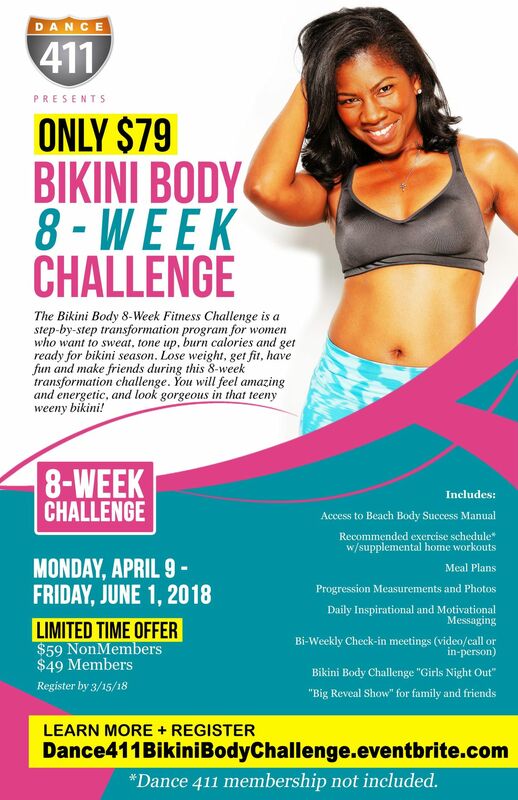 The Bikini Body 8-Week Fitness Challenge is a step-by-step transformation program for women who want to sweat, tone up, burn calories and get ready for bikini season. This challenge will guide you to live a healthier life and that can be adopted for a lifetime. This is also perfect for those who are just starting and need a jump start. In the first week, we will get rid of all of those toxins naturally with an all fruit and veggie detox. Then we will introduce fresh, nutrient-dense foods to give the body what it needs. And the side benefit to all this?.....if you follow the plan you will experience fat burn and weight loss. Lose weight, get fit, have fun and make friends during this 8-week transformation. You will feel amazing and energetic, and look gorgeous in that teeny-weeny bikini! Classes will depend on which membership you decide to join. For our complete schedule, CLICK HERE . The BBC Challenge is $FREE for those who join our VIP All-Inclusive Membership (see below). YES, $FREE! * Sign up for our VIP All-Inclusive and pay $0 for the BBC 8-Week Challenge. Go to www.JoinDance411.com to complete membership registration. * The BBC requires a certain number workouts per week, and one of our Dance 411 memberships above is highly recommended. Why not have fun while getting fit with our high-energy dance and fitness classes? 2. How will I receive the meal plans and recipes for The BBC 8-week Program? YES! This program has been approved by a dietician and is safe for diabetics. HOWEVER, we always require you to check with your own doctor before starting any new meal plan. 5. What are the fees for the BBC? 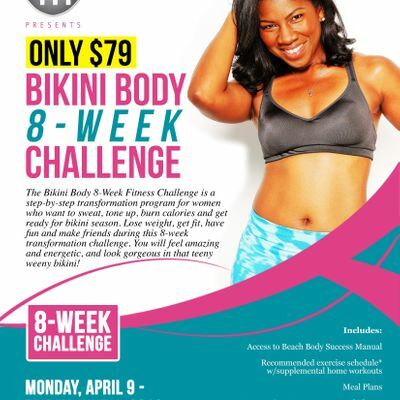 The Bikini Body Challenge begins Monday, April 8th and continues until 8 weeks. It's best to register by Friday, April 5th to receive materials for weekend meal prepping. 7. What are the times of classes? We currently offer a variety of classes per week. CLICK HERE to see schedule. We encourage a minimum of 5 classes per week. We find that those who attend classes as well as in-person check-ins have a higher success rate. We want you to succeed! We're here to support you! Challengers can be athletes looking to maintain weight to those who want to lose weight and even for women who just have that 5 -10lbs that just won’t go away. It’s open to all women. All are welcome to Dance 411 Studios. Some only have 5 or 10 pounds to lose and just want the extra accountability and family environment at Dance 411 Studios. Or you may just want to maintain your health and wellness. This program is perfect for that as well. Membership is not included however, the BBC Challenge is $FREE for those who join our VIP All-Inclusive Membership (see below). Classes will depend on which membership you decide to join. For our complete schedule, CLICK HERE. * Sign up for our VIP All-Inclusive and pay $0 for the BBC 8-Week Challenge. Why not have fun while getting fit with our high-energy dance and fitness classes? 16. Where are you guys located? From Interstate I-20 (five minutes east of I85/I75 downtown, and five minutes west of I-285) take (Exit 60 or 60A) and go South on Moreland. Travel through one traffic light. Dance 411 Studios will be on the right, after passing McDonalds, directly before the second traffic light. We are about a ½ mile south of the exit. We have free parking at the studio however, space is limited. The good news is that we have expanded our parking at the lot at the corner of Glenwood and Moreland Avenues. If the Dance 411 lot is full, you are free to park there. It's only a skip away.